There are so many touchstones of U.S.–Japan friendship throughout our common history, but I was especially intrigued by the story of Tsuda College. 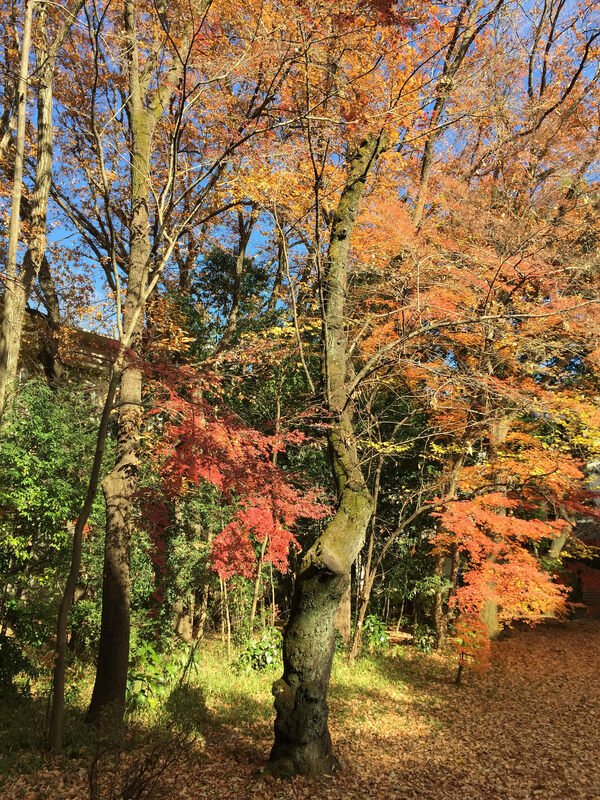 At the invitation of President Yuko Takahashi, I visited the main campus in Kodaira on a chill autumn day. The trees were in their full fall colors and the charming older school buildings reminded me of the lovely small colleges in New England. I was hoping to see one of the college’s treasures in particular, one that shows the American ties woven into the school’s history. Ume (or Umeko) Tsuda was only six years old when she was sent on an official mission to the United States in 1871 with four other Japanese girls to experience immersion in American life and perhaps bring back the secrets of women’s important role in our society. When she came back at 17 she had to rediscover the country and the language she had left behind as a child. Later she studied at all-women’s Bryn Mawr College, where my daughter studied the Russian language one summer. 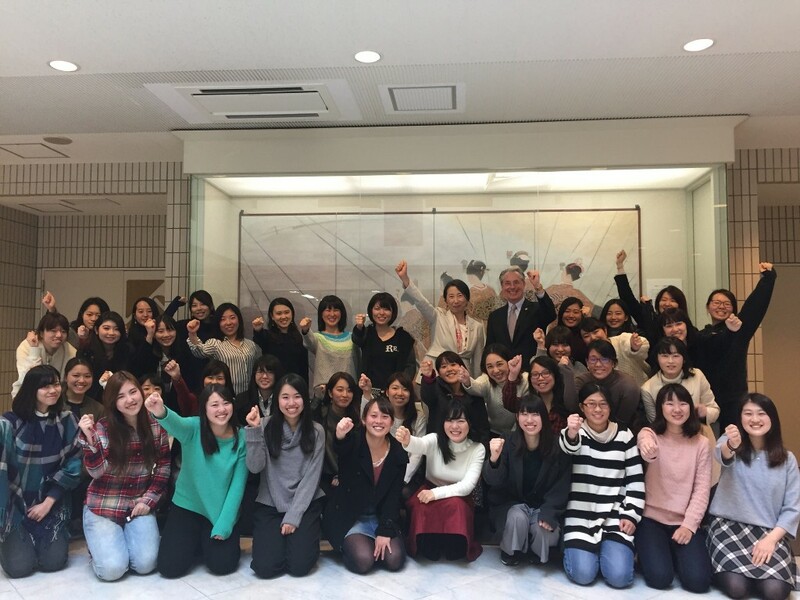 The network of committed and influential women Ume established there sustained a lifetime of service to women’s education. In 1900 she founded Tsuda College, which thrives to this day. Ume was an early fund-raising wizard. When the school needed money for construction or programs, she went to the United States, addressing women’s groups around the country and soliciting contributions. After the Great Kanto Earthquake of 1923, she crisscrossed the United States to raise money for a new main building, which was designed by outstanding architect Koichi Sato and still proudly stands today. The building is named after another intrepid woman, Anna Cope Hartshorne, who crossed paths with Ume at Bryn Mawr and led the effort that raised about $500,000 – an astounding amount for the time – to rebuild the campus we know today. I found the treasure I was looking for in the archives, among charming examples of the primers and books they used in the classroom in the early years. Ume communicated most naturally in English and corresponded all her life with her American mother. 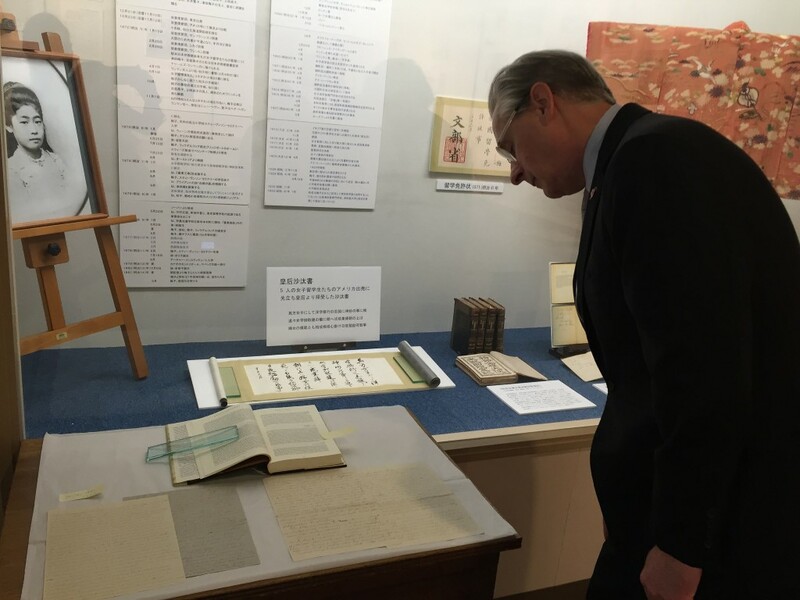 During the war years Ume hid these letters in the attic of Tsuda College’s main building. The letters were found in the 1980s, and included the ones Ume wrote just days before she passed away, marking a lifetime of profound connection with the family that nurtured her throughout her life. 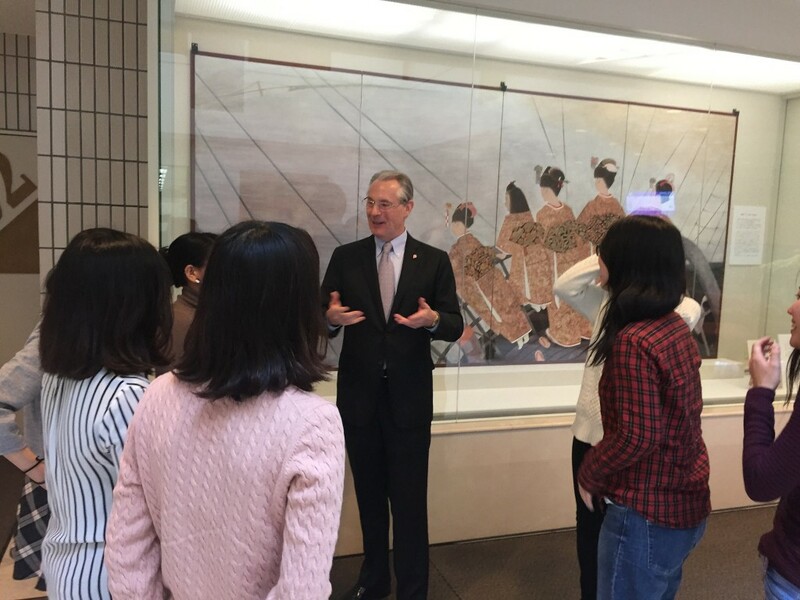 After speaking to a class, I spent a poignant moment posing with President Takahashi and a group of talented students in front of a painting that envisions the five Japanese girls when they arrived in San Francisco. Ume was so little she had to stand on a step to see over the side of the ship. The courage of this gifted child is only matched by the courage of the woman she became, who persevered against incredible odds to help the women of Japan. I think it was fitting for me to spend a day of reflection in this school, which represents the deep roots of friendship between our two countries, the spirit of reconciliation, and the incredible opportunities for future collaboration. As I watched Prime Minister Shinzo Abe and President Obama make their historic visit together to Pearl Harbor, I was moved yet again by the endless power of reconciliation and partnership.